Home / News, Views & Updates / Which Environmental Auditing Course? I wrote a piece on which environmental auditing course people should do as it’s a question we frequently get asked here in SQT. Because of updates, I have re-posted this post with modifications. We have four Environmental Auditing courses. IEMA Approved Lead Environmental Auditor Course (Ireland). The title of this course has changed. It was previously known as the IEMA Approved Advanced EMS Auditing Course (Ireland). Be competent to conduct an internal environmental audit. This course is very popular and when run in-house, can be tailored to suit company requirements and include an on-site practical audit. The next three courses are IEMA accredited. IEMA, The Institute of Environmental Management and Assessment is an independent, non-profit making organisation, dedicated to raising standards of professional competence in the environmental auditing and environmental management systems auditing fields and is the largest body of environmental auditors world-wide. More information on IEMA can be found on their website here. The IEMA approved Foundation course and Lead Environmental Auditor course are both five day intensive training courses. The Foundation course will be of interest to company personnel who are responsible for implementing or maintaining the EMS in their company. It will also be of interest to those who are responsible for the internal environmental auditing function within their company. The Lead Environmental Auditor course prepares delegates for the role of environmental auditors/assessors of EMS to standards acceptable to third party certification bodies. Attendees should be familiar with the requirements of ISO 14001/EMAS before attending this course. The course is intended for environmental and quality professionals who have previously attended an IEMA approved course or who have a sound understanding of EMS and who wish to improve their environmental auditing skills and refresh their knowledge of environmental issues and themes. In other words if you have a good prior knowledge of EMS and need more training in auditing skills, the Lead Environmental Auditor course is for you. If you need intensive training in EMS, then the Foundation course is more suitable. Both five day courses get a lot of material covered. The practical component on both courses is based on a comprehensive case study. With both five day courses, there is continuous assessment of practical work through out the course and a written examination at the end. A certificate of competence is awarded to participants who satisfactorily complete the course continuous assessment and examination. Both five day courses meet the training requirements for registration as an Associate Environmental Auditor with IEMA. To register for the next level of Environmental Auditor, you will also need to meet the specified auditing hours required by IEMA. Finally we provide the three day IEMA approved Internal EMS Auditing course only as an in-house course. This is similar to the first course covered above, but is IEMA accredited. As well as covering European/Irish legislation, this course also Northern Ireland legislation. 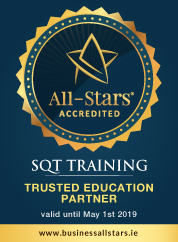 People who have queries on any of the above can email akelly@sqt.ie.